My foodie friend also known as Hipster Brian recommended this tiny little brunch joint that’s located in the most obscure of places. You absolutely have to plan to come because there is no way you’ll just ‘bump’ into this restaurant while strolling in an industrial area. On the way to Seattle from Vancouver, this is right off of exit 254. 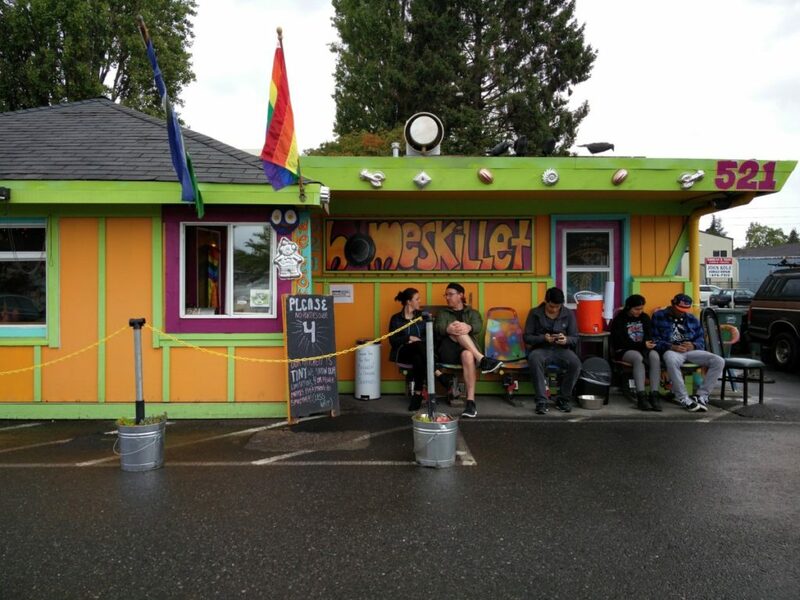 The Brunch Skillet is owned by a couple (the guy is called Kirby!!!!) and they have an incredibly endearing story on the menu that you can read while contemplating your brunch choices. Their story made me want to support their business even more! 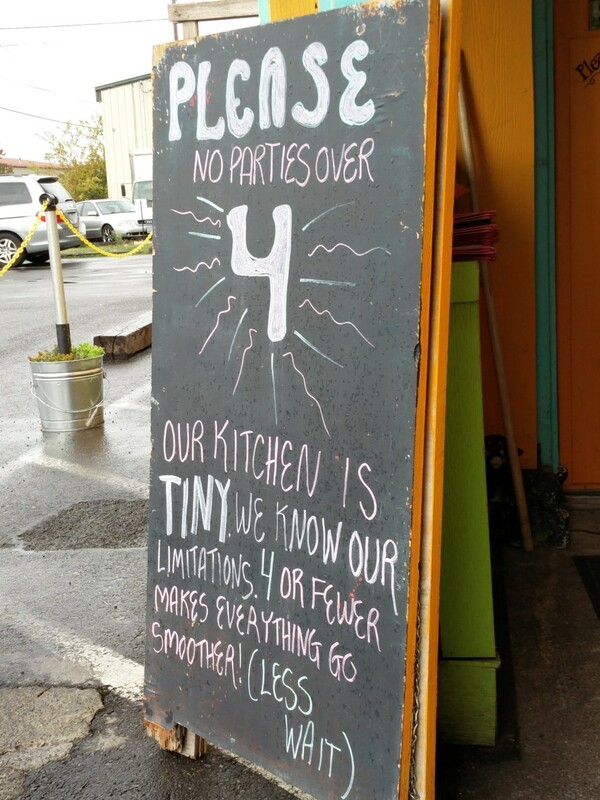 One thing to note, this restaurant does not support any tables over 4 people. 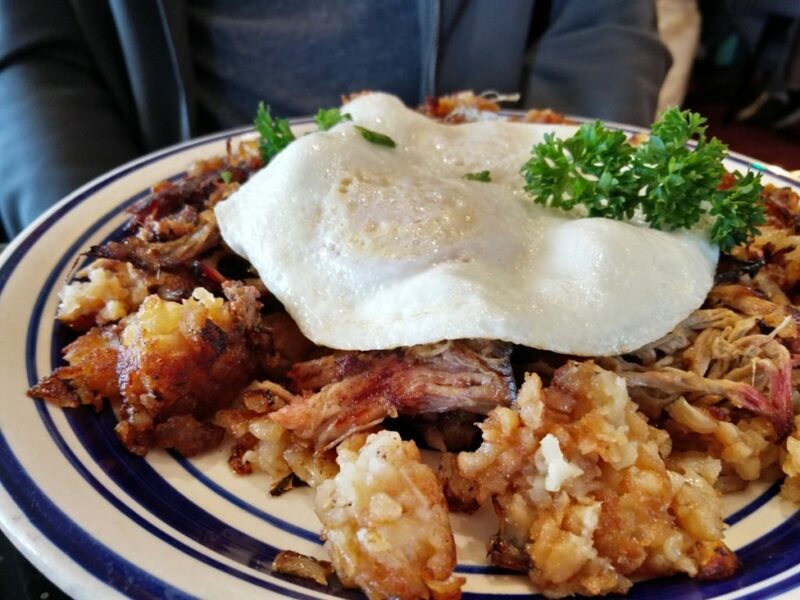 Meta Knight got the Pulled Pork Tater Tots Hash and Eggs ($10.00) which was an incredibly lucky decision because this dish was the bomb!!!! Instead of just regular potatoes for the hash, they smashed up fried tater tots and pan fried it some more… need i say more? 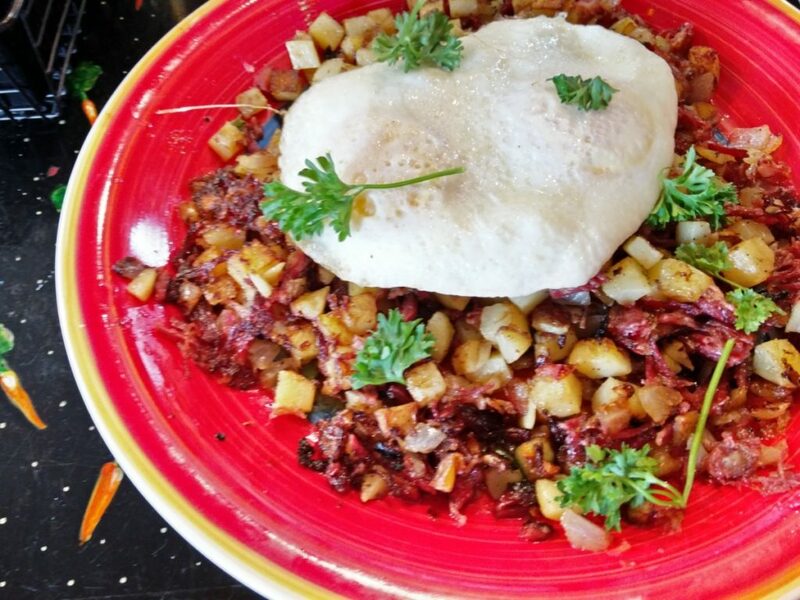 I on the other hand wanted to try homemade corned beef so I got the Homemade Corned Beef Hash and Eggs ($10.00). I got my eggs over easy but I should’ve gotten it sunny side up. 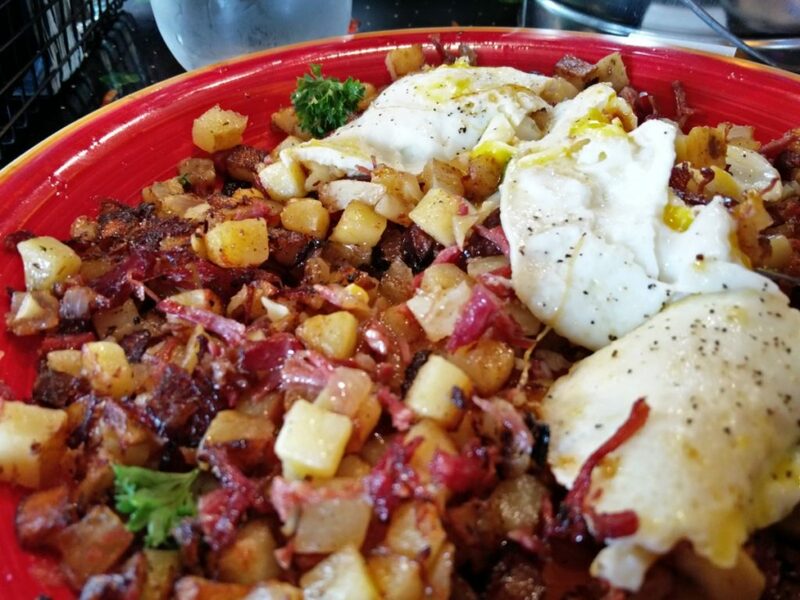 Either way, the runny lava of yolk was amazing in combination with the smokey salty corned beef and fried potatoes. I must admit though, the corned beef was no competition against the pulled pork tater tots. Either way, we both left The Home Skillet feeling 300 pounds heavier, and groveling at the fact that we have to sit in a car for another 3 hours stewing in our own fat. 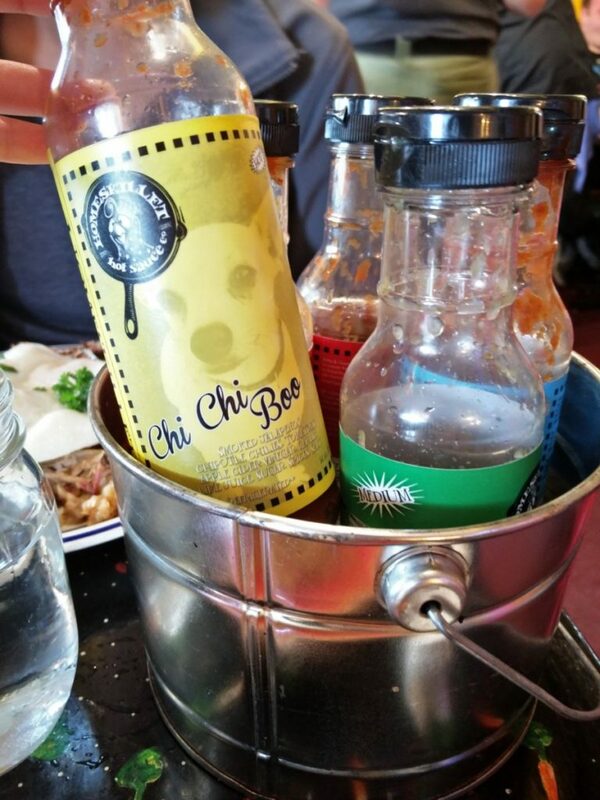 The couple, Kirby and Tina also own many dogs, and they spotlight each dog on their homemade sauces. Don’t worry, no dogs were harmed in the making of those sauces. And the sauces are bomb so you MUST try each and every single one with your dish. MUST. This one is a no brainer because if you ask anyone about Seattle, Pike Place Market will be one of the top three places people will tell you to visit. 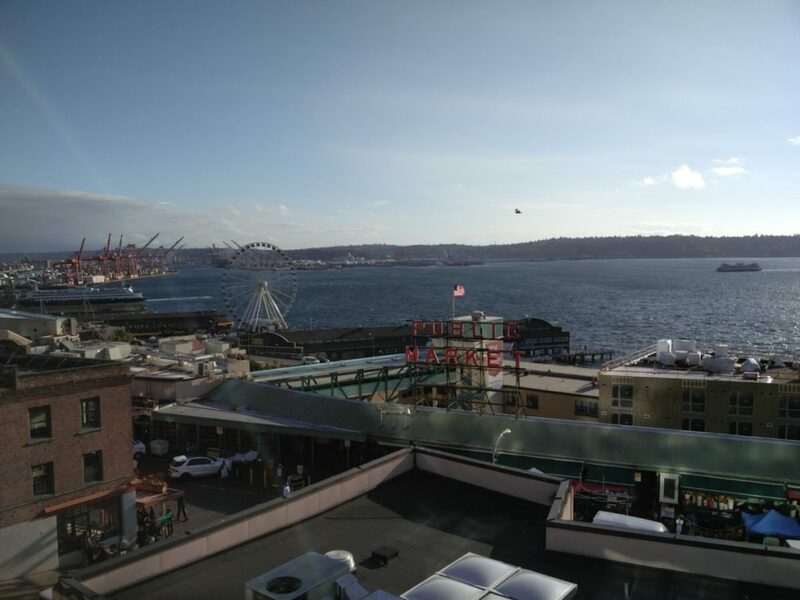 Because parking is so bad (not to mention expensive), I would suggest getting a hotel close enough to Pike Place so you can walk there and back during the day. 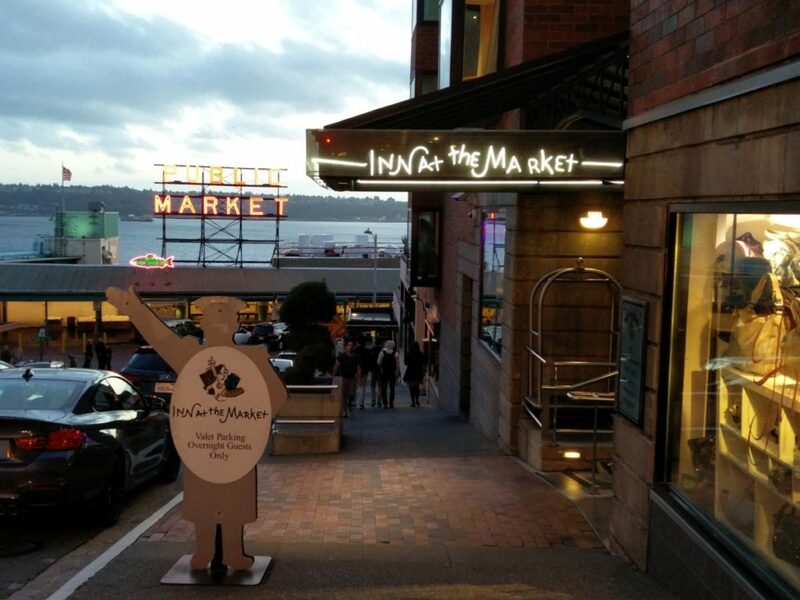 Inn at the Market is the closest hotel to Pike Place and is also the highest rated hotel in Seattle on Trip Advisor. 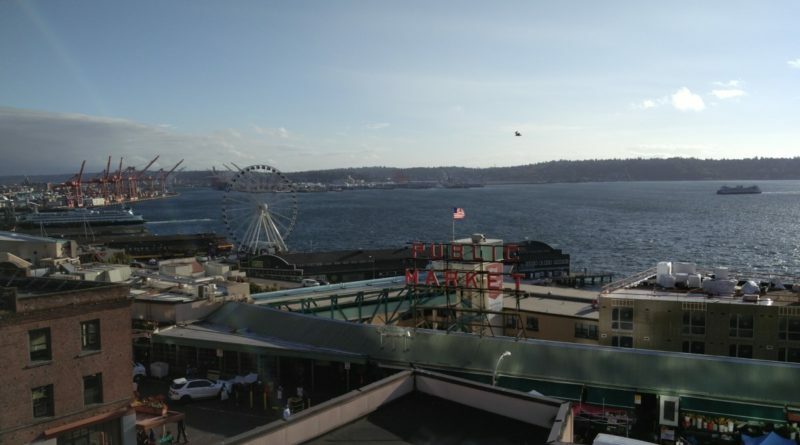 They are literally 5 seconds away from Pike Place!! 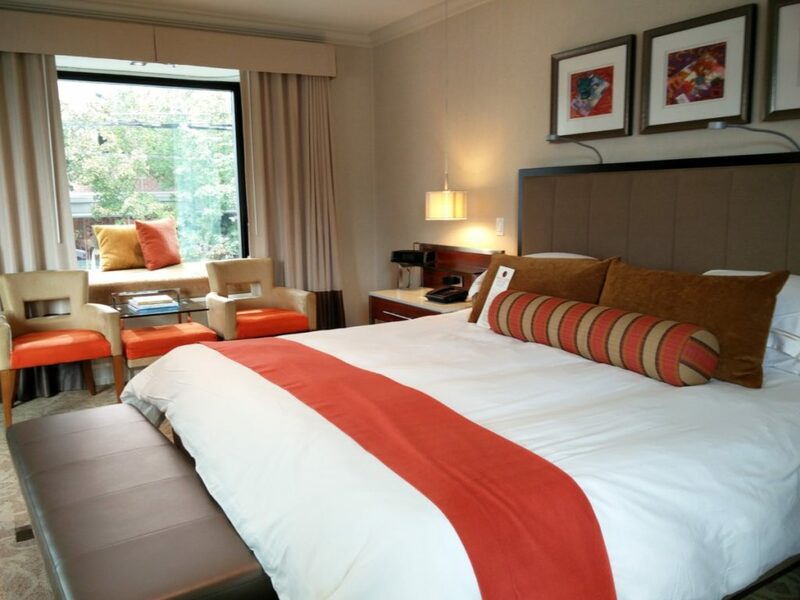 The basic rooms are already incredibly spacious (king sized bed ftw!) 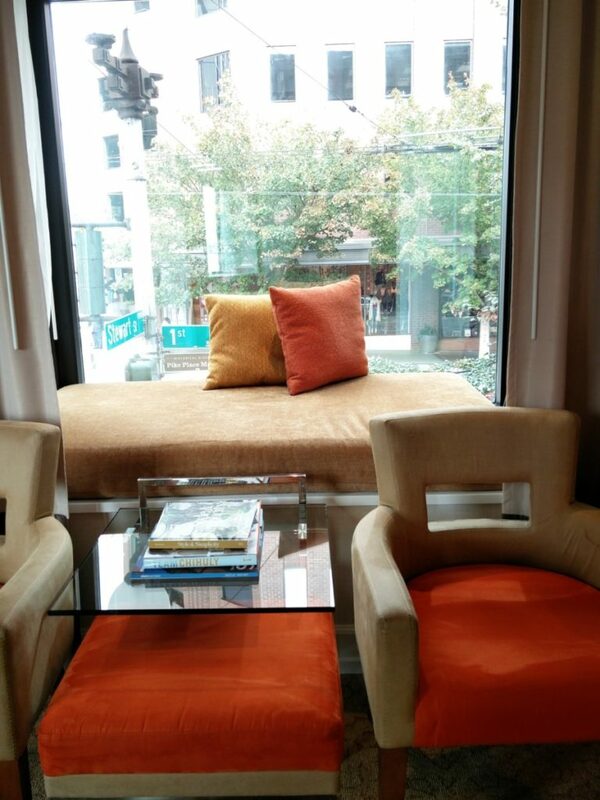 and has many areas for you to work (if you’re on a business trip), chill (if you’re into people watching), and watch TV. 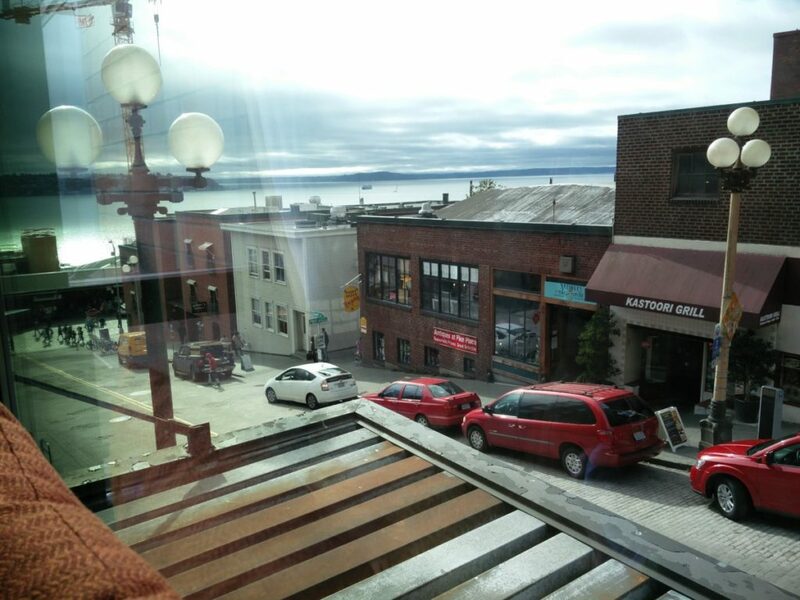 The view from the room – you can see that this road is essentially Pike Place Market. They have a patio on the fifth floor that’s open for guests to chill and watch the view so we brought our food and coffee up here to eat multiple times during our stay. This is truly a hidden gem and you won’t get this view anywhere else. 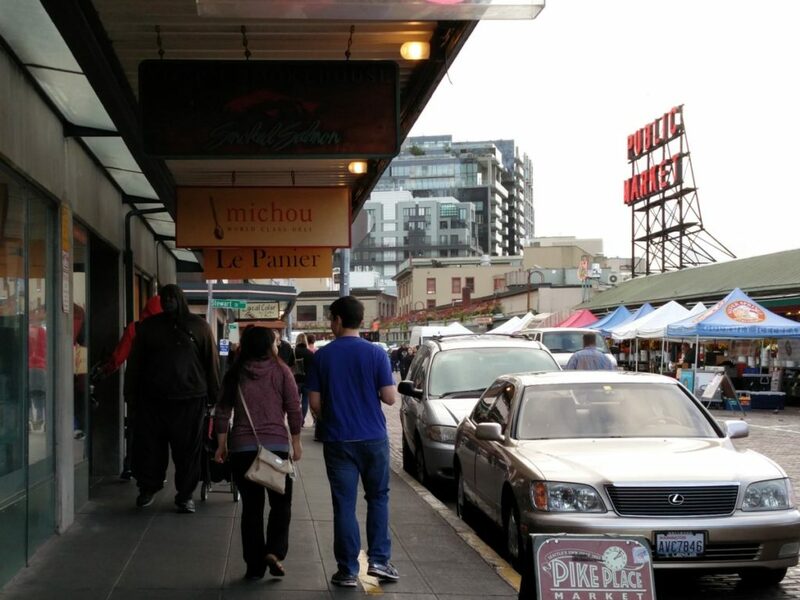 At Pike Place, there are vendors you MUST visit. 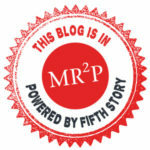 I’ll list them in order of priority (separate blog posts attached). 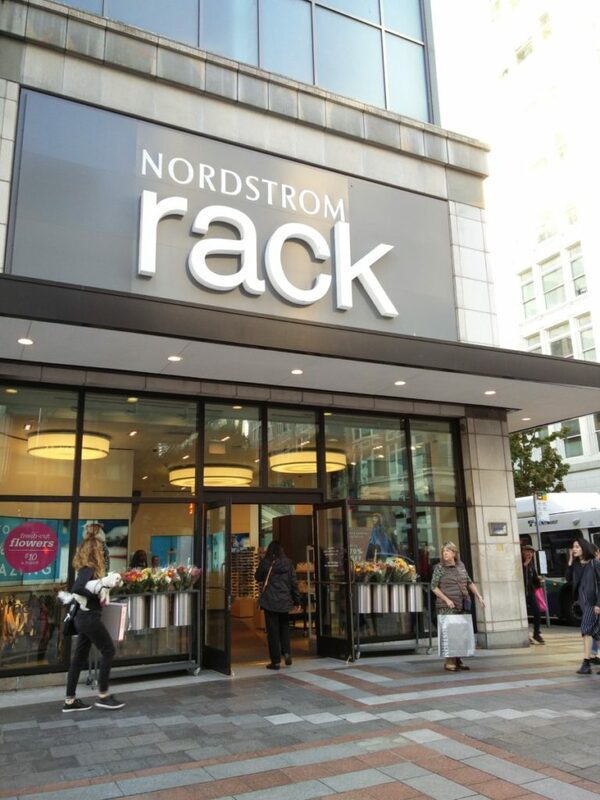 You may have heard of the famous retailer Nordstrom but did you know they have a more wallet friendly sister store called “Nordstrom Rack”?? 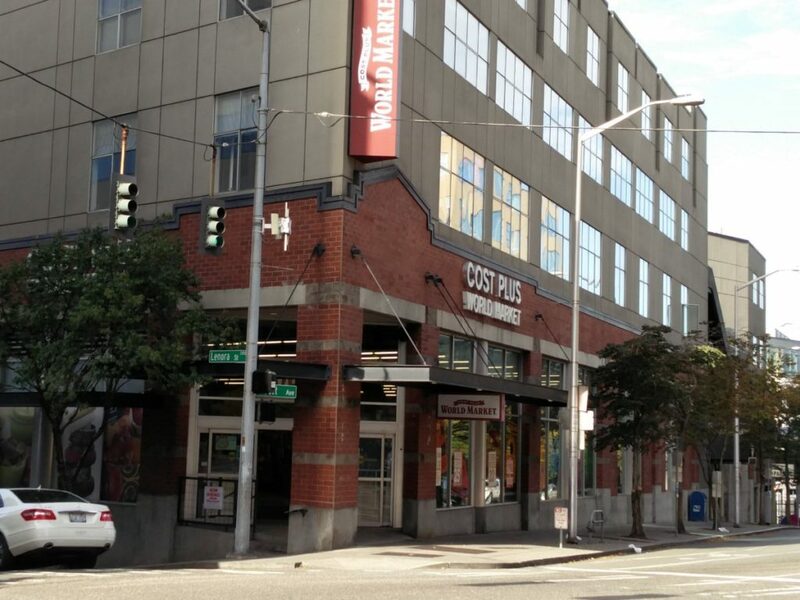 It’s located in downtown Seattle and is a fantastic place to shop if you want to find some expensive brand names without paying the expensive brand name price. You can buy a pair of Tory Burch shoes there for under $100 or a pair of Jessica Simpson sandals for $30. My friends and I always go to Nordstrom Rack when we come down to Seattle. From the outside, it’s hard to tell you just how amazing this store called World Market is. It looks like any random old store and the exterior clearly does not entice people walking by to enter. However, they offer the largest variety of eclectic, hipster, and unique home decor/food items/jewelery/furniture and it’s not available in Canada! The prices are also very affordable so you always know you’re getting a good deal. 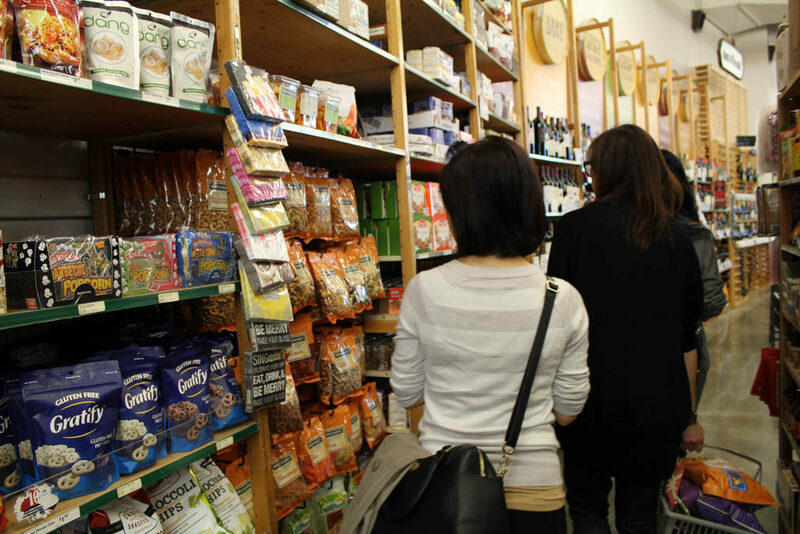 When it comes to food items, they have snacks from all over the world including Japan, Sweden, China, Italy, German, India, US, Korea…etc. 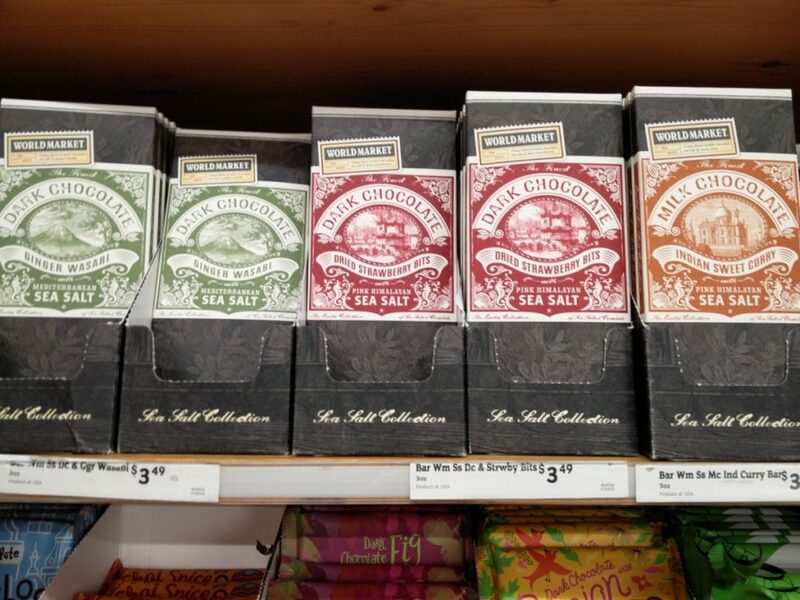 Care to try some Ginger Wasabi or Indian Sweet Curry chocolate bars?? 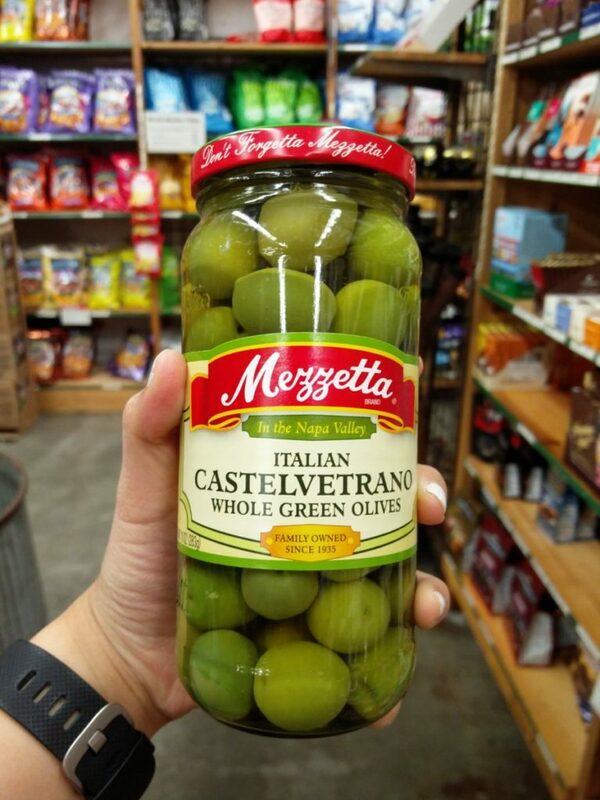 I was able to find these Castelvetrano olives here! Couldn’t find them anywhere here in Vancouver. These are the bomb (for non olive lovers like myself) because they are super mild and nothing like the pungent black ones that people usually like for pizza. 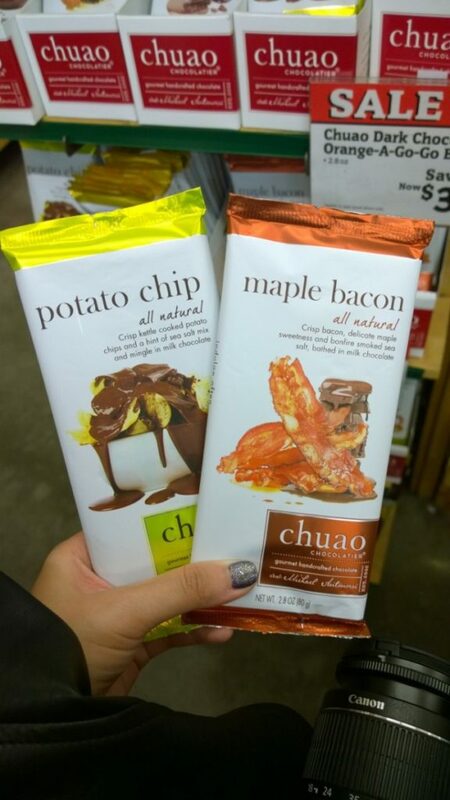 For those of you who have not seen these flavours before, yes! 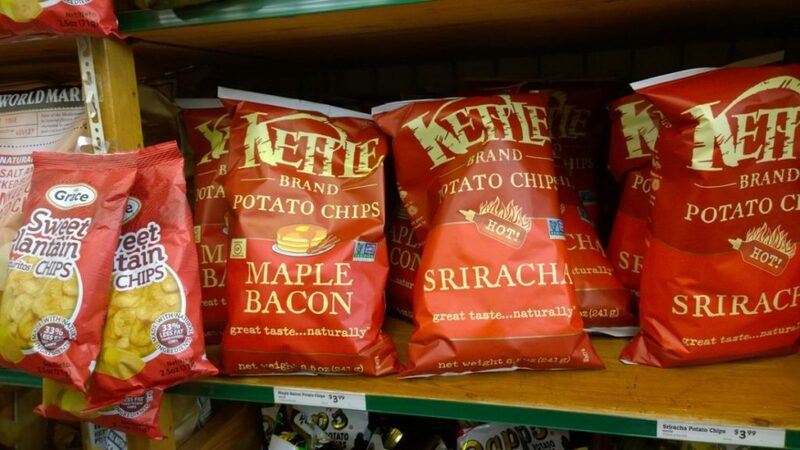 There are Maple Bacon and Sriracha flavoured chips!! 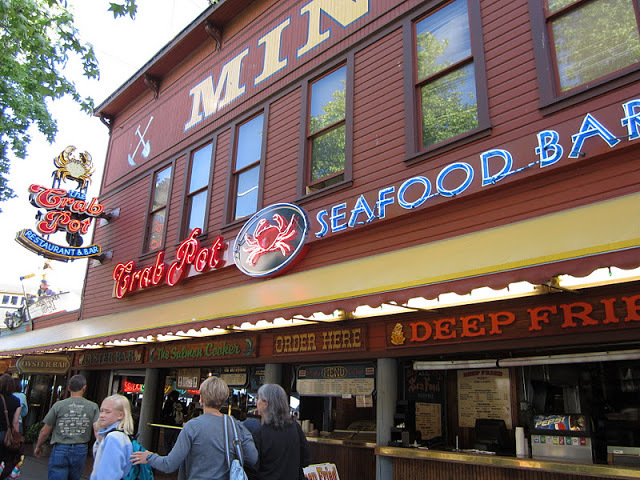 Pier 57 is the most popular pier of all the piers in Seattle and I highly suggest trying out some seafood while you’re in the area. I’m a lover of oysters so I always get either raw or cooked oysters at the “Oyster Bar” located in the image you see above. They also serve seafood boils, deep fried seafood, and a bunch of other things but oysters is my favourite item to get here. 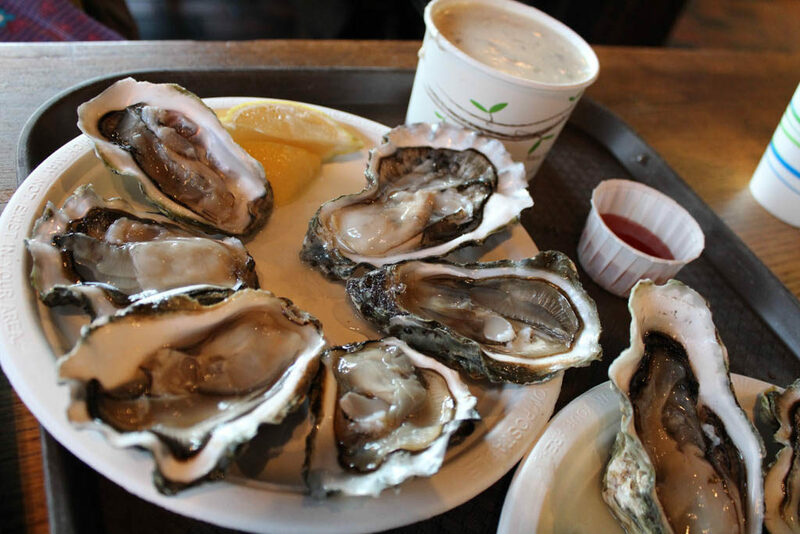 The good thing about the Oyster Bar too is that it’s super casual so you can go in, grab a couple of oysters, then be on your way to continue the sightseeing! 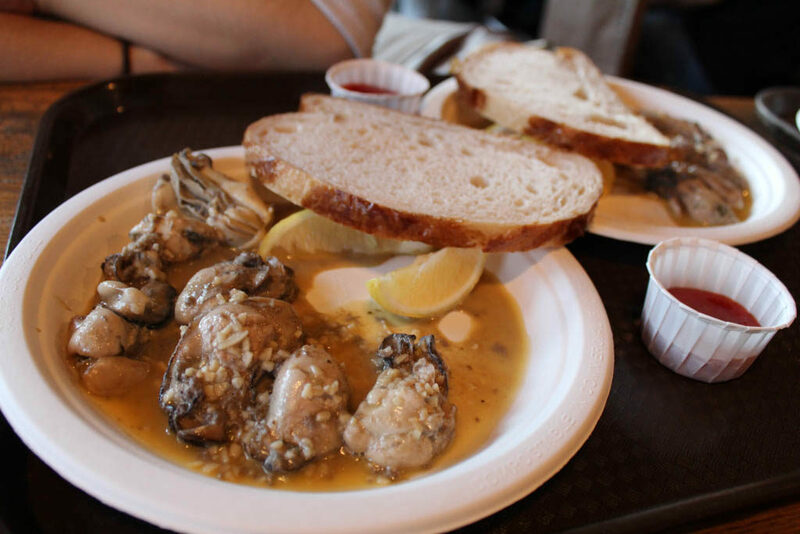 We got a bunched of Sauteed Oysters with garlic and it comes with a couple lemon wedges, cocktail sauce, and a slice of white bread. Now this is where it’s at! Half a dozen Raw Oysters won’t cost you more than 2 dollars USD a piece so it’s a pretty good deal considering it’s usually about $3-$4 CAD. The oysters are fresh, local, and you can definitely taste the difference in quality. 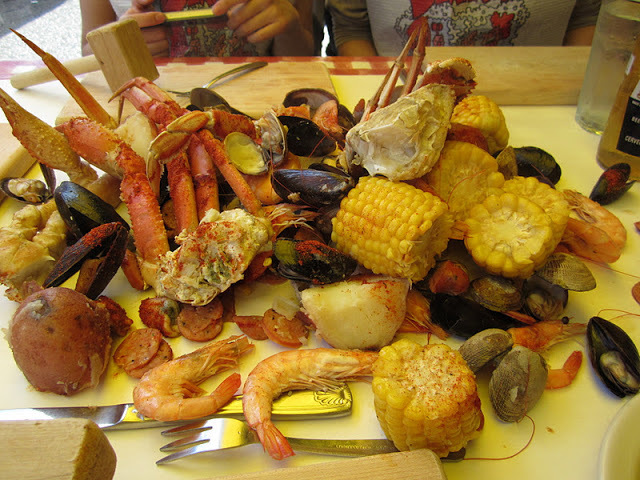 If you’re interested in dining at a sit down seafood restaurant instead, I would recommend The Crab Pot also located in Pier 57. 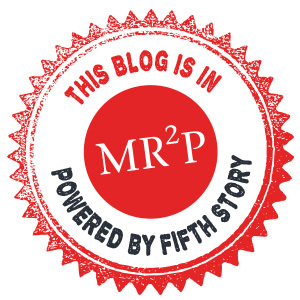 Check out my full post here! 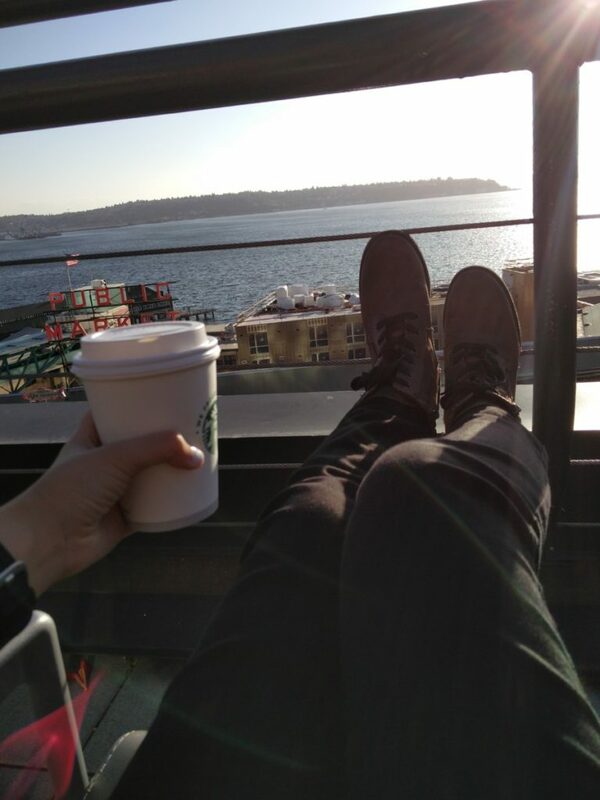 Did I miss any of your MUST VISIT places in Seattle?? Please share in the comments below! awww nahh, you don’t know anything girl! 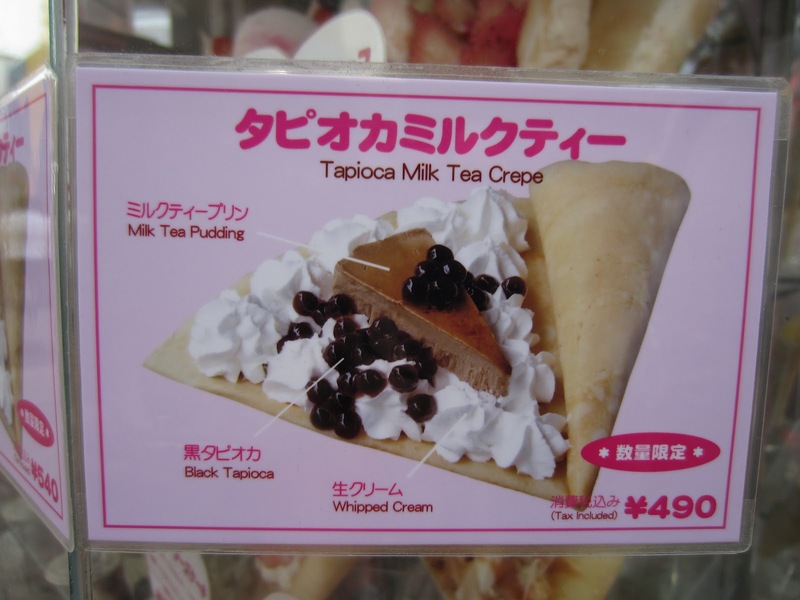 Angels Heart (Tokyo,Japan)- Milk Tea + Pearls Crepe?! Oh Yes.